I know every week you look forward to hearing Darren’s personal stories about being uncomfortable and how they relate to leadership, but I hope you won’t mind me filling in for just one week. Even Darren needs a break from his regular tasks every now and then. Last week my church had Bob Goff in as a guest speaker. If you haven’t heard of him, he’s the author of the New York Times Best-Selling book Love Does. He was also attorney for years and the founder of the non-profit Love Does that fights for human rights while also providing children with education in countries like Afghanistan, Uganda, Nepal, and India. When he was just a little way into his presentation he said, “Comfortable people don’t need Jesus.” He made some great points and it got me thinking about SPEARity and all of you. The point he was making was that we don’t need help with our lives if we aren’t pushing forward and stretching ourselves outside of our comfort zones. If we’re living comfortably we can do it within our own means. We don’t need any help. Apply this to your business and work life. If you’re comfortable in your position and business, you don’t need help. The tasks that you do each day are the things you already know how to do. You work with people you’re comfortable with and know what to expect out of each day. Things might “feel” pretty good, but you’re probably struggling to grow. Or, things don’t feel that good because you know you aren’t living up to your potential. Uncomfortable doesn’t feel good, but it’s where we need to be if we want to improve ourselves and our businesses. This is why SPEARity loves working with uncomfortable people. Business coaching and leadership development is wasted on people that just want to stay comfortable. It’s the people that are willing to push outside of their comfort zones that our coaches are really able to help. One of the tricky things is when you stick with the process long enough uncomfortable becomes comfortable. The things that used to seem so hard in the past aren’t any longer. You reached goals that you never really believed you could and have experienced the personal and business growth that you always wanted to have. When you hit this point you have a new choice to make. You can either go back to living comfortably or you need to step out of the new comfort zone and embrace uncomfortable once again. It’s a cycle. Remember, uncomfortable might not feel great, but it’s where you need to be if you truly want to experience growth on a personal and professional level. And, it’s where you need to be if you want a business coach to be able to help you. You don’t need help to live and work comfortably. 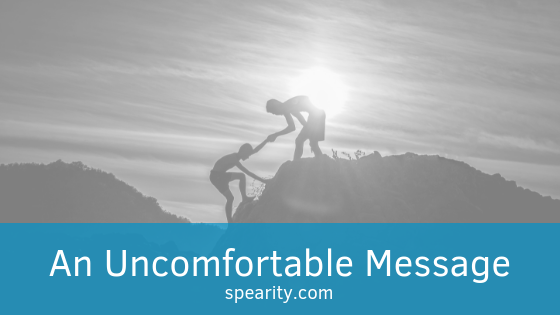 If you’re ready to explore how SPEARity can help you embrace uncomfortable, give us a call. We are SPEARity, a local Milwaukee leadership coaching firm that specializes in business coaching, executive coaching, and leadership development training.